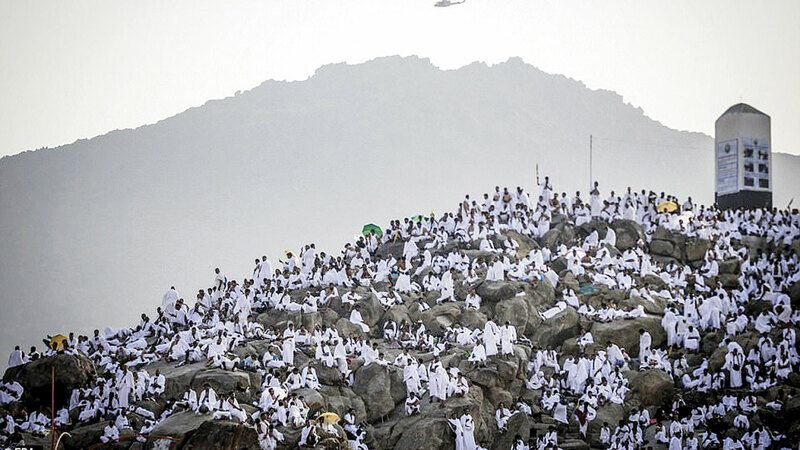 More than two million pilgrims from Nigeria and around the world will converge on Mount Arafat today to mark the highpoint of Hajj. The hill was where Prophet Muhammad is believed to have delivered his last sermon. It is also the place where Adam and Eve were said to have reunited following their departure from heaven. The Muslim calendar marks today’s event as happening on the 9th day of Dhul-Hijjah 1439 in the lunar month. The religious activity precedes Eid-el-Kabir when devotees slaughter animals in sacrifice. high hill, offering supplications for forgiveness and praises of Allah. Prior to the ascent, the pilgrims spend a day under makeshift tents at Mina, a suburb of Mecca, seeking the mercies of God. “Arafat Day is the only one where God forgives sins and shortcomings of the larger percentage of Muslims, especially those on Arafat. Through His mercies, God will also forgive those who are not necessarily on pilgrimage but who work closely with pilgrims. Allah says the sins of those on pilgrimage would be cleansed and they will return to their destinations as persons with records of no sins in life,” Dr. Suleiman Zubair, a lecturer at the Federal University of Technology, Minna, Niger State, told The Guardian. He explained: “Another thing Muslims are expected to learn on this day is tolerance and unity. The convergence of pilgrims from across the globe, despite differences in language, ethnicity and culture, is a critical lesson on unity. In readiness for the event, the Saudi health ministry said it deployed 25 hospitals, 155 health centers and 180 ambulances. The ministry also urged pilgrims to increase fluid intake, to avoid dehydration amid the extreme temperature. But the cost of livestock for the yearly ritual and other items have got some Nigerians worried. Prices at markets in the Federal Capital Territory (FCT), Abuja, and Nasarawa State have skyrocketed. Rams were not even available at some places, while some traders complained of low patronage. At Zuba, Lugbe and Nyayan markets, Kugbo ram market and the depot in Mararaba, there was increase in the prices of animals compared to last year. A small ram at Kugbo, sold N30,000 in 2017, cost N40,000-N45,000. At Zuba, a medium-sized ram, which a few days earlier was N40,000, cost N60,000-N65,000. A big ram had a price tag of N80,000-N150,000. Mallam Abdlmumin Dadinkowa, a ram seller from Yobe State, decried the challenge of bringing the animals to Abuja, saying: “The cost of transportation is too high. A trailer-load of animals from Yobe State to Abuja has increased from N300,000 to N450,000.” He also blamed the high prices on the insurgency in some parts of the country from where the animals are sourced. One Mallam Kudus Aliyu, a ram seller from Borno, regretted that incessant Boko Haram attacks have forced many of his colleagues out of business. A buyer, Alhaja Aolat Adamu, who said she could not afford the cost of a ram, opted for a goat instead, while Mr. Yusuf Fouad hoped that prices would crash after the first day of the festival. Sellers in other parts of the country like Zaria, Bauchi and Kano also complained of low patronage. “By this time last year, I had sold over 45 rams few days to Sallah. But as I am talking to you now, I have only sold 15,” said Saidu Bako, at Tarauni cattle market in Kano. Security arrangements, meanwhile, are being put in place to ensure a safe celebration. Inspector General of Police, Ibrahim Idris, said the deployment of additional personnel and crime prevention and detection equipment would be made. The Enugu State command of the Nigeria Security and Civil Defence Corps (NSCDC) deployed 2,000 combat-ready personnel to strategic places within the state. In Zamfara, the police deployed 1,200 officers. In Ekiti also, the commissioner of police, Bello Ahmed, declared the readiness of his men to stop any attempt by unscrupulous persons to breach the peace. Amid the festive mood, founder, Paseda Legacy Foundation and the 2019 Unity Party of Nigeria (UPN) governorship aspirant in Ogun State, Otunba Olatunde Rotimi Paseda, has asked Muslims to spare some moments for next year general elections. He asked Nigerian pilgrims in Mecca to pray for the success of the 2019 general elections.